The Decca team have had the honour of helping Dame Vera Lynn celebrate her 100th birthday - and launch her new album. 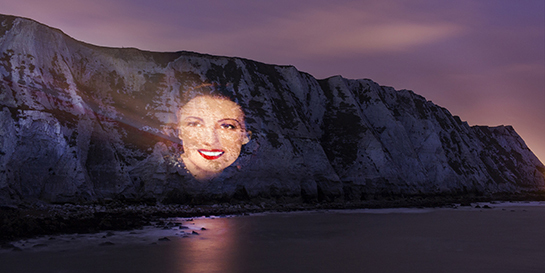 The big day, Monday, March 20, was marked in spectacular fashion by a 350ft image of Dame Vera being projected onto the iconic White Cliffs of Dover. Her classic song, named after one of Britain's most famous geographical landmarks (and symbol of defiance during World War II), was a number one in 1942. The new album, Vera Lynn 100, came out the previous Friday (March 17) and entered the charts at number three a week later, making Dame Vera the oldest living recording artist to enter the Official Albums Chart (she is already the oldest person ever to have a number one album, after We'll Meet Again reached the top spot in 2009). She is the only singer in the world to have been in the pop charts from the 1940s to the present day - and she has been a treasured Decca artist every step of the way. The outpouring of warmth and respect for the original Forces' Sweetheart was overwhelming throughout the week as the nation celebrated the life and career of one of the most famous, and certainly most beloved musical artists in British history. As well as mountains of birthday wishes from the general public, there was a welter of glowing media coverage for Dame Vera. She was featured on over 30 television shows, including all the main channel's news and breakfast programmes, and in all the national newspapers, from the Sun, Mirror and Star to the Telegraph, Times and Guardian. Senior marketing manager Gavin Bayliss said: "Everyone at Decca is extremely proud to be a part of Dame Vera’s lifelong record label. To be able to help celebrate her 100th birthday with a new album, and see her popularity as strong as ever, has been very special. The whole team at Decca have done an incredible job, delivering front page news, blanket TV coverage as well as creative marketing both on and offline to mark the occasion. From trending on Twitter, getting into the top 10 albums on iTunes through to hundreds of birthday telegrams and a projection of her onto her most iconic location, the White Cliffs of Dover, she is set to break records all over again. Happy 100th Birthday Dame Vera Lynn!"